Once upon a time, there was a Field of Fresh Greens. 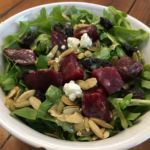 Then one day, the field of fresh greens wanted more, so he called on the powers of Sweet Beets, Tangy Goat Cheese, Tart Dried Cherries and Toasted Pumpkin Seeds to rain on him and he was happy. He was overfilled with happiness and strength and was the most powerful Field of Greens in the land. But he was still a bit lonely. So, he hired a friend named Miso Dijon Vinaigrette who had qualities that he liked: oily olive oil, sour-sweet lime, spunky dijon, and mellow white miso. Now he was happy, strong, powerful, and in the good company of friends with great taste. Mix salad ingredients into a large bowl. Feel free to change amounts of ingredients; this is just a rough guideline. For the beets, you can peel and shred them raw with a cheese grater. If you like them steamed, wash, boil 1 inch water in pot, put beets in steaming basket, lower heat, cover, steam on stove until soft, about 30 minutes, plunge in cold water, remove skins and cut. If you like beets roasted, wash, toss in olive oil, wrap in foil, bake at 375 F until soft, about 45 minutes, cool, peel and cut. You can also find yummy beets fully cooked, cut and packaged at Trader Joes and, I'm sure, other grocery stores. Mix dressing ingredients in separate bowl. Toss desired amount of dressing with salad. Store any remainder of dressing in fridge for another salad!